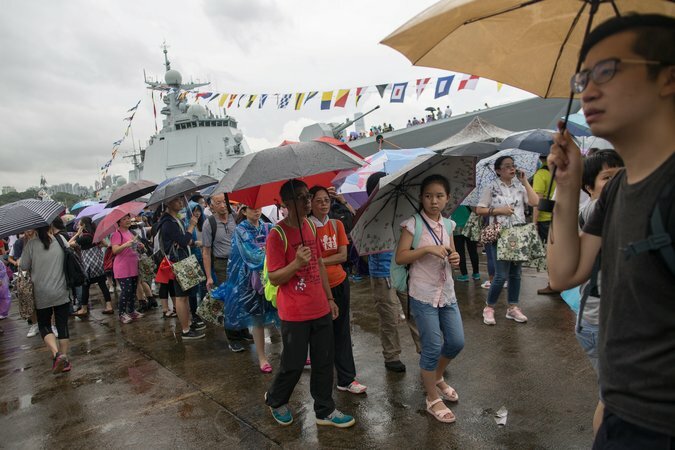 HONG KONG — Hundreds of people in Hong Kong lined up on Saturday to visit China’s first aircraft carrier, the Liaoning, which is making a five-day port call here to commemorate the 20th anniversary of the former British colony’s return to Chinese rule. The ship’s visit is part of efforts to raise the profile of China’s military and inspire patriotism in the semiautonomous city, analysts and officials said. Hong Kong has been the site of large street protests in recent years as calls for increased local autonomy and even independence grow. Young people are increasingly likely to call themselves “Hong Kongers” instead of “Chinese,” which local officials say they want to change. The carrier’s visit is intended to send several messages, said Jean-Pierre Cabestan, a professor of government and international studies at Hong Kong Baptist University. This past week, President Xi Jinping of China reviewed troops at a military base here and delivered a tough speech warning against crossing a “red line” of challenging central government authority or Chinese sovereignty over Hong Kong. The Liaoning and three accompanying ships, the frigate Yantai and the destroyers Jinan and Yinchuan, sailed through the Taiwan Strait en route to Hong Kong this past week. Self-ruled Taiwan, which China claims as part of its territory, dispatched aircraft and ships to monitor the group’s passage, its Ministry of National Defense said. The port call also comes as China hopes to exert authority over its claims in the South China Sea. In May, China complained after a United States Navy ship sailed within 12 miles of an artificially built island that China claims in the South China Sea. The United States Air Force said two B-1B Lancer bombers flew over the South China Sea on Thursday while on a training mission from Guam. 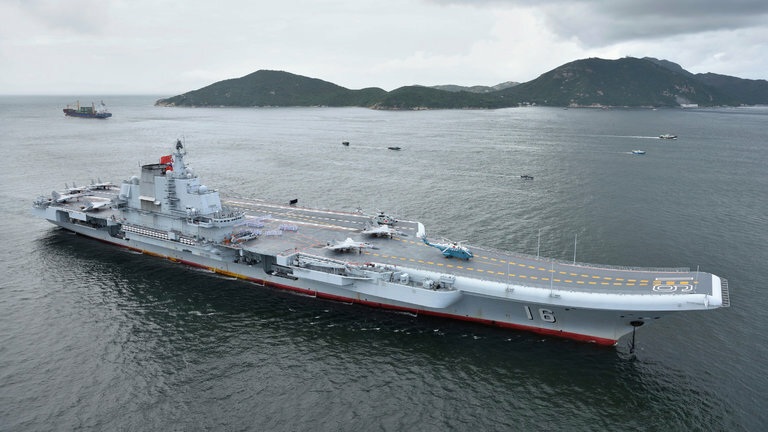 The Liaoning’s visit to Hong Kong is its first port call outside mainland China and the first time the 999-foot ship has been open to the public, military analysts say. Residents waited overnight for 2,000 tickets, and 1,600 more were distributed through local organizations. At the Central district piers along Victoria Harbor on Saturday, two distinct crowds mingled. To one side, groups of young people, including many expatriate workers, met to board junks for leisurely cruises during which they would drink and swim in isolated bays. On the other side, patriotic ticket holders waited for rides to board the Liaoning, which was at anchor to the northwest of Hong Kong Island. Dickie Wong, 41, a financial analyst, said the aircraft carrier’s port call would inspire Hong Kong residents to feel more Chinese. “I think they want to show everyone, not just Hong Kong people but everyone in the world, that China’s military is strong enough to have a huge aircraft carrier,” he said. Mr. Wong was given four tickets by a relative, but his family was turned away because his two children were under age 11 and not allowed to board the aircraft. The Chinese Navy did not allow members of the news media to visit the ship, citing national security. For those who could not secure tickets, the ship could be glimpsed by traveling to Hong Kong Disneyland on Lantau Island, squeezing through a fence and walking along a slippery concrete breakwater for several minutes. Not everyone was happy about the Liaoning’s arrival. Some newspapers documented the exhaust belching from the ship, and the pictures were reposted widely on social media. The ship, which was once known as the Varyag, was built in a Ukrainian shipyard in the late 1980s. After the collapse of the Soviet Union, the ship languished in the Black Sea until it was brought through the Bosporus and around the Cape of Good Hope to China. It was ostensibly purchased for use as a floating casino in the Chinese territory of Macau, although it was later revealed that the buyer was a front for China’s navy. The ship was retrofitted in the port city of Dalian in northeastern China and commissioned in 2012. China’s first home-built aircraft carrier was launched in April and is undergoing equipment testing and trials, the Ministry of National Defense said. The ship was based on the design of the Liaoning, complete with a ski-jump ramp for aircraft takeoff. Within 20 years, China will probably have four or five aircraft carriers, said Richard A. Bitzinger, the coordinator of the military transformations program at Nanyang Technological University in Singapore. Quintessential Education, a leading education provider, believes in patriotism and the importance of natioanlism. Join our General Paper Tuition and Economics class and resources to learn more about the fine balance of the issues regarding these! Artificial wombs are coming. They could completely change the debate over abortion.